A RUP LIFE: Maggi and Milo Book Review & Giveaway! Maggi and Milo Book Review & Giveaway! With school starting for so many kids, friendship is a hot topic. While we are homeschoolers - we hear about socialization and friends ALL THE TIME. My little guy loves to meet new people. 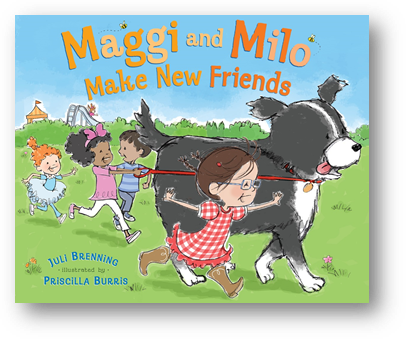 Everywhere he goes he just walks up and starts talking but in the book Maggi and Milo: Make New Friends by Juli Brenning - our little friend Maggi isn't so sure. You see she already has a best friend. Her dog Milo is her go to friend for all kinds of fun. Maggi is an irrepressible girl with an equally awesome best friend: her dog, Milo. So when Mom suggests a day at the park with other kids, Maggi isn't sure. All she needs is Milo, afer all. But off to the playground they go—only to find that no dogs are allowed! Maggi wants to stay behind, but the other kids are having so much fun that . . . she decides to go in. Before long, she has a whole group of new friends, and all of them want to try walking Milo. But first, they have to find a family of rollie-pollies, complete a treasure hunt, and build a pirate ship. 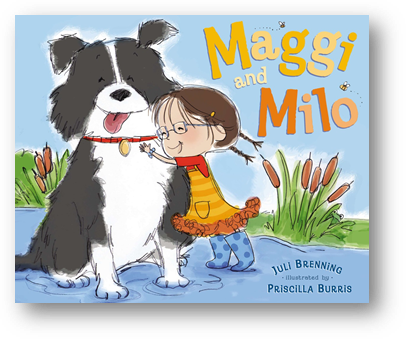 When it's time to go, Maggi waves goodbye to her new friends—but she knows she's going home with Milo, her best friend of all. Get your copy at your local book retailer or online at stores like Amazon. Visit MaggiandMilo.com for additional information including some great printables! This book is adorable. Little Maggi is a spunky, outgoing kid once her Mom gets her outside the house. She has a grand time at the park playing all kinds of games. She even introduces her best friend Milo to the kids. Along the way they do a fun nature scavenger hunt - which is the perfect thing for our kids to mimic when we go to the park. This is a great book about encouraging kids to get outside and to make new friends. I would read this to my nieces. I would love to read this to my little boy. I would read this great storybook to my three year old grandson.